The 6th edition is updated to reflect the latest Supreme Court cases, government regulations, and state laws. Every employer and HR professional should keep it close at hand. Most managers and human resources professionals—particularly those who work for larger companies—have to deal with federal employment laws every day. These laws apply in nearly every stage of the employment relationship, from hiring and first-day paperwork, to providing benefits and time off, to terminations and layoffs. Whether you are developing workplace policies, creating forms and notices for your company to use with employees, or handling employee performance and discipline issues, you need to understand your company’s legal obligations—and make sure that you don’t inadvertently violate the law. It can be tough to find out exactly what these federal laws require. That’s where this book comes in. It explains all of the major federal employment laws: whom they protect, who has to follow them, what they require, and what they prohibit. Each chapter in this book covers a single federal employment law and describes the obligations employers have under each law, including deadlines, posting requirements, and record-keeping rules. If you need more information, each chapter includes a list of additional resources. And many chapters include charts that provide information on state laws. Government employers. Although we explain which (if any) federal, state, and local government workers are covered by each law, we don’t detail the special rules that may apply to government employees. For example, although federal government workers are protected from certain types of discrimination by Title VII (see Chapter 18), they must follow a special complaint process that doesn’t apply to private companies. We don’t cover that process here. Federal contractors. Private employers that contract to do work for the federal government are subject to additional employment laws. We don’t cover those laws here. This overview chapter provides the information you need to get the most out of this book. First, we explain how to figure out which federal laws your company has to follow and when and how state and local laws might come into play. Next, we cover a handful of practical strategies that will help your company comply with these laws, such as consulting with a lawyer, documentation, and training. Finally, we explain what to do if you need more help. Employment law comes from many sources. Each of the federal laws (also called “statutes”) covered in this book has been interpreted and refined by court decisions and sometimes by regulations issued by the federal agency responsible for enforcing and administering the law. Many of the topics covered by these laws are also addressed by state, and sometimes even local, laws. If more than one law applies, employers generally must follow whichever law is more beneficial to employees. You can use this book to figure out which federal laws apply to your company, which employees are protected by those laws, and whether those laws apply to the situation you are facing. “Which Federal Laws Apply,” below, will help you get to this information quickly. This book also provides charts that summarize the laws of the 50 states and the District of Columbia, at the end of some chapters. However, you may have to do some research on your own—or talk to a lawyer—to find out whether a state or local law applies to your situation. This topic is covered in “Which State and Local Laws Apply,” below. Federal employment law consists of three components: the statutes themselves, any regulations issued by the federal agency responsible for administering the law, and court decisions interpreting the law and regulations. Together, these sources define what the terms in the law mean, what employers have to do to comply with the law, and how violations of the law will be handled. Each chapter of this book covers a federal employment statute, any regulations interpreting it, and the major court cases decided under the law. Because the employment laws explained here are federal statutes, they apply throughout the country, regardless of what state the company or worker is in. This means that every federal law in this book has the potential to apply to your company if it operates in the United States. We say “potential” because none of these laws apply to every employer and employee, in every situation. Instead, most laws specify which employers need to follow them, which employees are protected by them, and what actions they prohibit and require. If your company is unionized, the first place to look for answers to your employment questions is not the law, but the collective bargaining agreement (CBA) between the union and the company. A CBA is a binding contract, so if it gives workers more rights in certain areas (most commonly, wage and hour issues, time off, discipline, and termination procedures), it supersedes the law. For example, let’s say you want to know how much time an employee can take off for childbirth and parental leave. You look up the Family and Medical Leave Act in this book and see that it requires covered employers to provide up to 12 weeks of unpaid leave. Your company’s CBA, however, gives employees up to 16 weeks of paid leave. Because the CBA is more generous than the law, you must follow its provisions. Generally, unions are not allowed to bargain away their members’ federal rights in a collective bargaining agreement. Therefore, a CBA typically cannot provide workers with less than what the federal law requires. However, there are some exceptions to this rule. For example, most courts have upheld a common CBA provision that requires workers to make certain workplace claims only through the union grievance procedure, rather than bringing them to court (which they would otherwise have the right to do). And some laws allow unions and management to bend the rules in a CBA; for example, although some state laws require employers to give workers specified meal and rest breaks, these laws may not apply to a workplace governed by a CBA. Statutes start out as bills passed by the U.S. Congress, which are then signed into law by the president. Statutes are collected in a set of books called the U.S. Code. The first page of each chapter of this book includes the location of the statute in the U.S. Code. For example, the Age Discrimination in Employment Act (ADEA) is found at 29 U.S.C. §§ 621–634; this means that it’s located in Title 29 of the U.S. Code, at Sections 621 through 634. Each chapter also provides a link to a website where you can view the statute online. Regulations are administrative rules issued by federal agencies. When Congress passes a law, it usually designates a federal agency to interpret and enforce that law. In employment law, these agencies are often responsible for receiving employee complaints, creating paperwork (such as posters or notice forms) that employers must use to comply with the law, and imposing penalties on employers that don’t meet their obligations. Sometimes agencies also issue regulations—rules that fill in some of the gaps not addressed by the statute. Regulations are collected in the Code of Federal Regulations (C.F.R.). If regulations have been issued interpreting one of the laws we cover, you’ll find a citation for those regulations—and a website where you can access them online—at the beginning of the chapter. Regulations are updated frequently; our citation is to the most recent version, but you should always check to see whether the regulations have been revised. Court decisions are opinions written by judges deciding the outcome of a lawsuit. Often, judges must interpret what a law means in order to decide who should win in court. For example, a court might have to decide what constitutes a reasonable accommodation for an employee with a disability or whether an employer’s decision to transfer an employee who complained of harassment constitutes illegal retaliation. Decisions by the U.S. Supreme Court are the most influential, because they dictate how federal employment laws will be interpreted throughout the country. Decisions by lower courts, such as the U.S. Courts of Appeal and the U.S. District Courts, are binding only in the states or regions those courts cover. Does your company have enough employees? Is your company otherwise covered by the law? Is the employee covered by the law? Do all of the law’s provisions apply? Is this situation covered by the law? Many employment laws apply only to employers that have a minimum number of employees. You’ll find these rules under the heading “Covered Employers” in each chapter. For example, an employer with only 20 employees is not covered by the Family and Medical Leave Act (FMLA); only employers with at least 50 employees must comply with that law. Is Your Company Otherwise Covered? Some employment laws don’t impose a minimum size requirement, but instead apply only to companies that engage in “interstate commerce” (and, in a few cases, meet a minimum of business volume requirement). These rules are included in the chart, “Laws That Apply by Size or Operations of Employer,” below. All but the smallest local companies are engaged in interstate commerce within the meaning of these laws. For example, if your company buys, sells, or handles materials or products that have come from or will go to another state, or if your company’s employees communicate across state lines as part of their job duties, your company is most likely engaged in interstate commerce. For decades, the U.S. Supreme Court has defined “interstate commerce” very broadly, to encompass virtually any activity that crosses—or could cross—a state’s borders. This expansive definition allows the Court to uphold Congressional legislation: The Constitution gives Congress the right to regulate interstate commerce, so Congress has the widest possible reach when interstate commerce is defined in broad strokes. In recent years, however, the Court has been scaling back this definition to occasionally find that Congress has overstepped its bounds. For example, although the Court ultimately upheld the Affordable Care Act (the health care reform law) on other grounds, a majority of the Court found that Congress exceeded its authority to regulate interstate commerce. This holding signals that the definition of interstate commerce remains in flux. If, after reading the relevant chapter in this book, you believe that your company is not covered, you should probably check your conclusion with a lawyer. Even laws that impose a minimum size requirement don’t apply to every employer that is large enough to be covered. Some laws include exceptions for particular types of employers and some apply only to certain types of companies. For example, the Sarbanes-Oxley Act of 2002 applies only to companies that are publicly traded or required to register with the Securities and Exchange Commission. You’ll find this information under the heading “Covered Employers” in each chapter. Do All of the Provisions Apply? employees are legally authorized to work in the United States. Each law covers a limited spectrum of employment issues and may not extend to the problem or question you’re facing. We’ve included two charts below to help you figure out which chapters to review. The first, “What Each Law Covers,” gives a very brief summary of the law. The second, “Laws That Apply to Common Employment Situations,” lets you know which aspects of the employment relationship are covered by each law. Once you decide which laws might apply, you’ll need to read the sections called “What’s Prohibited” and “What’s Required” in the chapters covering those laws to find out whether your particular situation is addressed. For example, if you have a question about discrimination, you’ll see that several laws prohibit discrimination in employment. You’ll also see that these laws prohibit different types of discrimination—for instance, the Civil Rights Act of 1866 prohibits race discrimination, while the Equal Pay Act prohibits gender-based wage discrimination. To find out precisely what each law requires and prohibits, turn to the appropriate chapters. In addition, some laws make exceptions for certain situations in which employers are not required to comply with the law. You can find this information in the “Exceptions” section of each chapter. For example, although the Worker Adjustment and Retraining Notification Act (WARN) generally requires large employers to give employees advance notice of a layoff, employers don’t have to give notice if the layoff results from the closing of a temporary facility. Even if you follow every applicable federal employment law to the letter, your company could still be violating other legal obligations to its employees. The federal government isn’t alone in regulating the employment relationship—state and local governments have been increasingly active in passing their own employment laws as well. If your company and situation are covered by more than one law, you must follow the law that is the most beneficial to the employee in a particular situation. This book will help you get started in figuring out which state laws might apply. At the end of many chapters, you’ll find charts summarizing the laws of the 50 states and the District of Columbia on the same topic. For example, at the end of the chapter on the FLSA, you’ll find charts on state minimum wage, overtime, and meal and rest break laws. However, these charts may not provide the details you need. In that case, you should contact your state’s labor or fair employment practices department (you can find contact information in Appendix A), consult a resource on the employment laws of your state, or talk to a local employment lawyer. To find out whether local laws might come into play, you’ll have to find out what your city or county requires. Some local governments post their laws (often called “ordinances”) or information for local employers on their websites; you can find links to many city and county websites at www.statelocalgov.net. You can also find out what local laws require by talking to a local employment attorney. State and local laws can be quite similar to federal employment laws: They cover similar topics, apply to only certain employers (often those with a minimum number of employees), and protect only certain types of employees. However, state and local laws often provide workers with more benefits and apply to a wider set of employers. If you live in a large metropolitan area, chances are good that local ordinances will apply to your company. * You’ll see that most of the antidiscrimination laws appear with nearly every issue. Because these laws prohibit discrimination in every aspect of employment, employers could violate them by undertaking any common employment practice with the intent to discriminate. For example, let’s say an employer required only applicants who have served in the military to take a psychological test, based on the hiring manager’s belief that such applicants are more likely to be mentally unstable. This would violate USERRA’s ban on discrimination against those who have served in the military, even though USERRA doesn’t explicitly address the issue of testing. Here are a couple of examples to illustrate how to figure out which laws your company has to follow. Example 1: The only manager of a four-employee graphic design company in Berkeley, California, wants to know what the company’s obligations are to applicants with disabilities. The federal Americans with Disabilities Act governs this issue, but it applies only to private employers with at least 15 employees. California also has an antidiscrimination law that prohibits disability discrimination, but it applies only to employers with at least five employees. However, the city of Berkeley prohibits all companies that contract with the city from discriminating on the basis of disability. Therefore, if the company wins a bid to redesign the city’s website, it will have to comply with this municipal law. Example 2: A national restaurant chain is considering expanding to New Mexico. Its HR director does some research and learns that New Mexico’s minimum wage is $7.50 an hour. Because this is higher than the current federal minimum wage ($7.25 an hour), the chain will have to pay its workers at least the higher state amount. But if the chain decides to open in Santa Fe County, it will have to pay workers at least $11.40 an hour, because the county has adopted a living wage law that applies to all employers that are required to have a business license from the county. Both federal and New Mexico law require employers to pay tipped workers a wage of at least $2.13 an hour, as long as they make enough in tips to earn the applicable minimum wage. However, Santa Fe County requires employers to pay tipped employees a base wage of at least $3.41 per hour. So, the restaurant will have to pay its tipped workers in Santa Fe County at least $3.41 per hour, and the employee’s total pay—including tips—must add up to at least the county’s minimum wage of $11.40. As you can see, things can get confusing if your company is covered by two or more laws that impose different requirements or seem to contradict each other. If you find yourself in this position, you may need some help figuring out what to do. This is a good time to consult with an employment lawyer. This book will help you understand which federal employment laws your company must follow and what those laws mean. However, to stay out of legal trouble, your company must do more than simply follow the letter of the law. It will also have to adopt some practical strategies to make sure that it meets its legal obligations. These compliance tools are not strictly “required” by the laws covered in this book, but a company that wants to avoid legal problems should consider them standard operating procedures. This section briefly explains a handful of basic strategies every company should follow, but it is only an introduction to these important topics. The ins and outs of creating an effective compliance program are well beyond the scope of this book. However, Nolo has plenty of detailed resources that will help you design and implement procedures for compliance; see “If You Need More Information,” below. Even the most conscientious HR professional occasionally needs help from a lawyer. Although you can handle many employment issues on your own, some are particularly tricky and require some legal expertise. As you read this book, you’ll see that we sometimes advise you to consult with a lawyer if you need more information on a difficult topic. And with good reason: Although lawyers don’t come cheap, your company can save money by paying a lawyer for advice and information that would be very time-consuming and difficult to research on your own. There are no hard and fast rules that determine when you should consult with a lawyer. You’ll have to decide when it’s time to get some expert help based on a number of factors, including your own comfort level, how important the issue is, how many employees are affected, whether your company is facing significant legal exposure, and your company’s budget. However, as a general rule, it’s better to consult with a lawyer sooner rather than later in any potentially difficult situation. Document drafting or review. A lawyer can create or edit documents you use over and over again, such as employment contracts, employee notice forms, waivers, your employee handbook, and other written policies. Advice on employment decisions. Of course, your company would quickly go out of business if it consulted a lawyer every time an employee was hired or disciplined, but there are times when a lawyer’s advice will be very valuable. If, for example, you are considering firing a worker who is on FMLA leave or has recently complained of sexual harassment, a lawyer can help you make sure that you have adequate legal support for your decision. Help understanding your legal obligations. As noted above, companies must follow whichever law—federal, state, or local—provides the most benefits for workers. A lawyer can help you untangle these obligations and assist you in figuring out your responsibilities when several laws overlap. Representation in legal or administrative proceedings. If an employee files a complaint with an administrative agency or a lawsuit, your company should consult with a lawyer right away. Good legal advice at the outset can mean the difference between winning and losing the case. 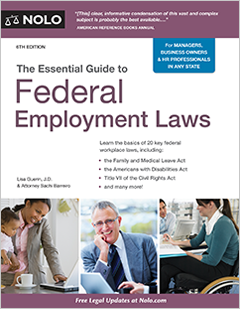 We hope you enjoyed this free sample of The Essential Guide to Federal Employment Laws. To read the rest of the chapter please purchase the book.